Protein Blend (Whey Protein Isolate, Whey Protein Concentrate), Peanuts, Vegetable Glycerin, Vegetable Oils (Palm Oil, and Palm Kernel), Soy Protein Isolate, Sorbitol, Sugar, Gelatin, Brown Rice Flour, Water, and Corn Syrup, Contains 2% or Less of the Following: Maltitol, Cocoa (Processed With Alkali), Sunflower Oil, Salt, Monoglycerides, Dextrose, Maltodextrin, Natural Flavors, Propylene Glycol Mono Esters, Acetylated Monoglycerides, Mono And Diglycerides, Natural Tocopherols, Silicon Dioxide, Citric Acid, Beta Carotene, Vitamin A Palmitate, Natural Butter Flavor, Baking Soda, Almonds, and Sucralose. Contains Milk, Soy, Almonds, and Peanuts. New Zilla High-Performance protein bar is the best tasting protein bar you’ll ever have! And it packs a potent 20 grams of whey protein in each gourmet bar. If you’re anything like me, you’re sick and tired of the mouth-watering pictures on protein bar wrappers only to find out what they deliver is an experience akin to compressed sawdust dipped in glue. What good is a protein bar if you have to force feed it to yourself? Nearing 3 years in development, the new Zilla High-Performance protein bar is gourmet nutrition on a whole other level. The taste is incredible. I’m talking candy bar goodness level. Three layers of soft, chewy deliciousness with just enough peanut crunch, dipped in creamy, mouth-watering milk chocolate and delivering 20 potent grams of muscle-building, hunger quenching whey protein. 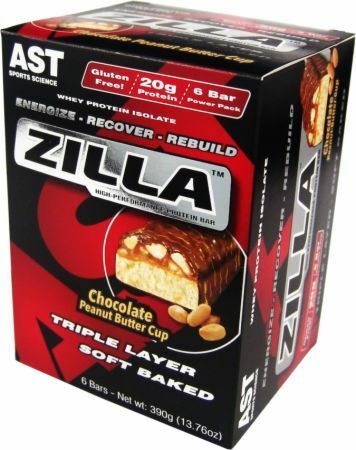 Zilla is a tripled layered bar giving you multiple taste and texture sensations from start to finish. A protein-packed, soft, chewy core is topped with a thick, creamy peanut butter layer and followed with a layer of crunchy, roasted peanuts. From here Zilla is dipped in rich, creamy, high-protein milk chocolate and finished off with a high-protein peanut butter drizzle. Zilla is great anytime to fuel and energize your workouts, satisfy hunger cravings, and kick-start recovery. Zilla is the perfect snack or quick meal on the go. Zilla is gluten-free, with only 5 grams of sugar and power-packed with 20 grams of whey protein.